Terrace Bay Resort and Torra Bay Campsite are the only two places to stay in the Skeleton Coast Park. 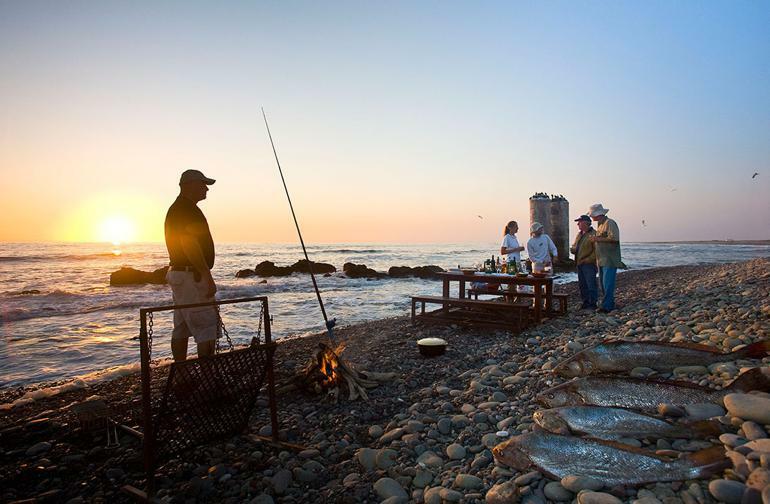 Torra Bay offers camping only and is about 4 hours north of Swakopmund. Torra Bay is only open in December and January each year. 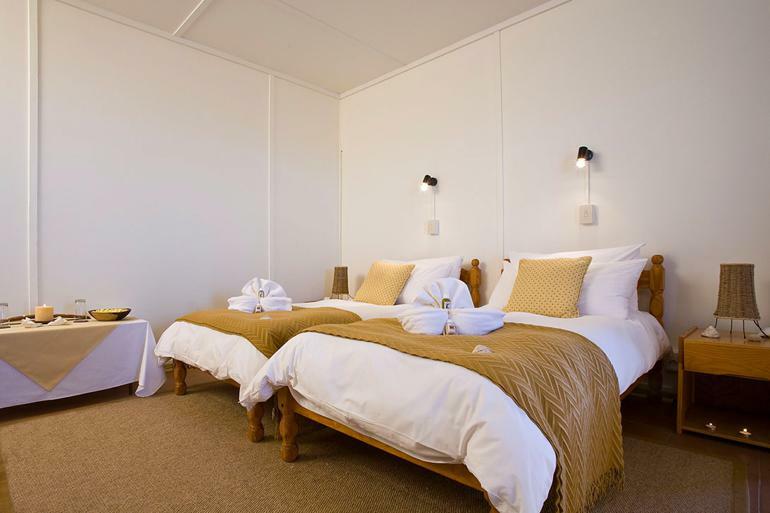 Terrace Bay offers self-catering houses as well as rooms. This Terrace Bay Resort is minimalism on the skeleton coast of Namibia. The perfect level of comfort is at Terrace Bay Resort. The Skeleton Coast Park is famous in angling circles for beach angling with fishing being excellent. It is a superb coastline to explore. The cold Atlantic and rough seas are synonymous with the Skeleton Coast. Other visitors use Terrace Bay as a base to explore the Uniab River Delta. The Unaib is a wonderful destination for hiking, bird watching, game viewing and desert dune scenery. Double rooms are available at the Resort. En-suite shower and toilet are in the rooms. Fridge freezer with a tea and coffee station. Six sleepers and ten sleeper beach chalets which are all self-catering with a fully equipped kitchen area. Bar and restaurant area is available at the Resort. There is a welcome Fuel station for travellers. 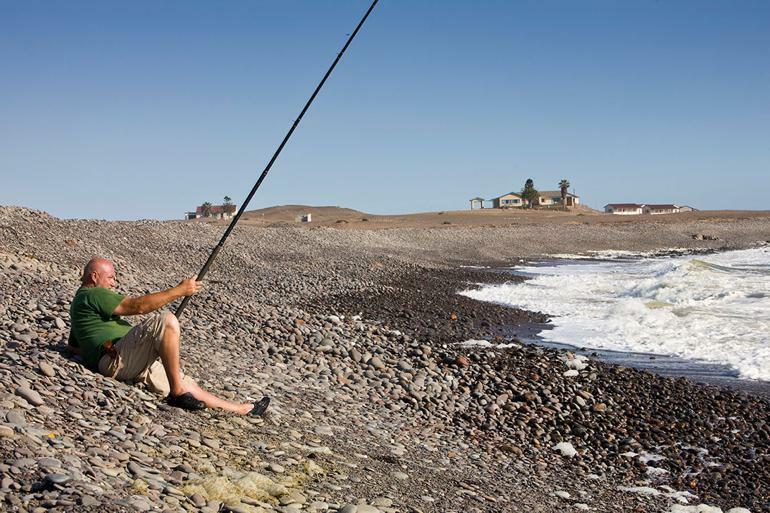 Fishing – bring own equipment and you can buy a fishing permit in Swakopmund. There is Game viewing and exploring the Uniab Delta. You can enjoy some Birding and hiking near the resort. Terrace bay resort is in the heart of the skeleton coast. This Resort is the perfect stopover when passing through along the skeleton coast and wanting to explore Damaraland and Kaokoland. This coastal drive is a great alternative road less travelled. You can meander off the main route when visiting Etosha National park. The resort is a top destination amongst the angler fisherman. This resort is the perfect camp in the heart of the skeleton coast. Terrace bay offers the bare essential needs that one requires to camp on the skeleton coast. Explore the skeleton coast and visit Terrace Bay Resort this coming season. The Skeleton Coast of Namibia shows the harsh desert environment. Driving along the skeleton coast and then via palmwag towards Etosha National Park. This skeleton coast road is a great route and offers the contrast of the landscapes of Namibia.